Hello Stampers! I am having so much fun making Summer cards! This umbrella image is from Chi Chi Memories' Beach Time set. I used my Cuttlebug to create textures without using patterned paper. I used two different embossing folders. The green dotted texture is done by inking the embossing folder with white ink and placing the paper on top then ran it through the Cuttlebug. I added a wave border and buttons. I freehand the banner after I stamped the sentiment. What a great summer card. Love the waves in the BG and you wonderful beachy color combo. Thanks for joining us. I really like the embossed background and the cute buttons! 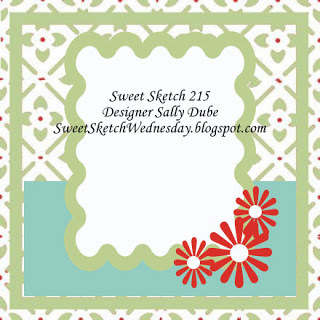 Thanks so much for joining us this week at Sweet Sketch Wednesday. Adorable, absolutely adorable! Makes me wish we were still on vacation at the beach. Thanks for joining us this week at Sweet Sketch Wednesday. the added buttons are so cute on your card and I love the embossing. Such an adorable summer time card. Thanks for joining us. Hi Kim this is a really cute card, just love your colours, buttons and embossing giving your card great texture. Great card and thanks so much for sharing it with us over at Sweet Sketch Wednesday and good luck. What a fun summer card. 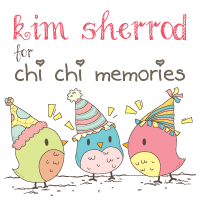 Thanks so much for sharing your work with us over at Sweet Sketch Wednesday! Hi Kim!! Love your card - The embossing adds so much texture! !